Artisan of Creative Miracles: I've Gone to the Birds! I've Gone to the Birds! As I've delved more into sketching over the past couple of years, I've wanted to learn how to draw birds. I've decided now is the time to try. So I visited my local library and borrowed The Laws Guide to Drawing Birds by John Muir Laws. 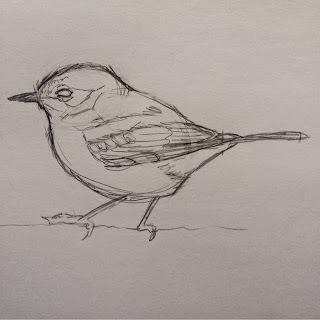 To the right is my first attempt using Muir's step-by-step directions for drawing a warbler. I'm quite pleased by the result!